SOME 45 years ago, Joan Ganz Cooney and Lloyd Morrisett discussed the platform which they would provide pre-schoolers with the advantage and opportunity of learning a thing or two as the kids sat fastened in front of the television set. It was after this discussion and deliberation that Sesame Street was mooted to disseminate an educational presentation of alphabets, numbers and other important lessons through Jim Henson’s colourful muppets with funny names and characteristics to match. One would not know the struggles or challenges the crew had encountered to keep itself relevant over the past four decades but Sesame Street should pride itself on the 159 Emmy Awards and eight Grammy Awards it has amassed as of this year, and the estimated 77 million American kids who had watched the series by the year 2008. Of the many muppets — Kermit the Frog, Oscar the Grouch, Cookie Monster, Bert and Ernie, Miss Piggie, Mr Snuffleupagus — it was a furry red thing with an orange nose which emerged in 1985 with the name, Elmo, that turned out to be a sensation. A funny character who refers to himself almost always in the third person, Elmo proved to be popular enough by 1998 that he was given his own full segment on Sesame Street called Elmo’s World. Elmo came to Malaysia, more specifically to the highlands of Genting, late last month to appear in his own musical Elmo Makes Music, thanks to Christopher J Harper, the talent behind this musical. This is in line with the original objective of the television show — to educate and encourage children to think out of the box while also teaching them to work through the restrictions that could potentially limit their abilities. The family-oriented musical that is 90 minutes long has 15 dedicated cast members who perform 25 songs designed to have a little something for parents and their children. “The beauty of this production is that it is written to have adult humour because the writers know that parents are going to be watching too and so, while it is written to primarily entertain and educate the kids, at the same time, the adults will also be entertained. It crosses both levels,” Harper said. He proceeds to give an example of a scene whereby Bert (the banana-looking muppet), who does a disco number, will come on stage dressed in a white suit, similar to the one John Travolta wore in the 1977 hit dance movie Saturday Night Fever. Bert usually dons a striped T-shirt and olive green pants. Hence, when he emerges on stage in the white ensemble, to the children, it’s hysterical, but for the parents, the scene will take them back to images of John Travolta grooving to the Bee Gees’ songs. “So, both the kids and the parents are entertained by this scene but for different reasons yet, at the same time, they get to share the funny moment,” Harper explains. Harper is grateful for the various roles he has held backstage over his 20-year career in live stage productions. “The opportunity to experience the whole gambit of everything — from being in charge of making the costumes and making sure that they last for the whole tour to doing the make-up for the cast to designing the backdrop for the production — in my opinion, plays a pivotal role because you take everything that you have learnt into account, especially when you venture into directing or choreographing,” he mused. Having done over 25 live productions, one would think that Harper might find it hard to have a favourite but he says this particular live musical is his favourite. “It has the best combination of songs from the older and latest version of Sesame Street. Also, the way that the show progresses is very fluid from one scene to the next. The other thing that fascinates me about this production is one particular UV (black light) number that has dancing feet. There have been many UV numbers in past productions, but somehow, this one just fascinates me. Usually, when people ask me how a UV scene is engineered, I will simply say it’s magic!” he said with obvious exuberance. As the conversation progressed, Harper recollects how he would not be living this illustrious career if not for his older sister. Having been dragged along by his parents for one of his sister’s school productions, the then five-year-old Harper was fascinated just watching his sister singing as a chorus member and decided there and then that he wanted to do just that for the rest of his life. Also as the younger sibling, Harper said he was forced to be his sister’s dancing partner for all her home dance show productions that were staged in their hall for their parents. This, he noted, sparked his interest to go into choreographing. For Harper, being on stage is not about the attention, but the smiles and laughter he will be able to inevitably give the audience through his performances either on stage as one of the muppets or in this case, the director of the musical. “I do like performing on stage but what I honestly like is seeing the reaction on people’s faces. Like for instance, when I played the Cookie Monster. As I was walking out, I saw kids wearing the Cookie Monster T-shirt or some putting their hands out for a high-five or asking for a hug and looking so excited… that is the best feeling in the world. It honestly is. I live for the small moments of seeing their faces light up when the muppets come out. That’s what makes my day,” Harper said. Elmo Makes Music will show at the Genting International Showroom until Jan 3. Tickets are priced from RM88 to RM158 for adults. 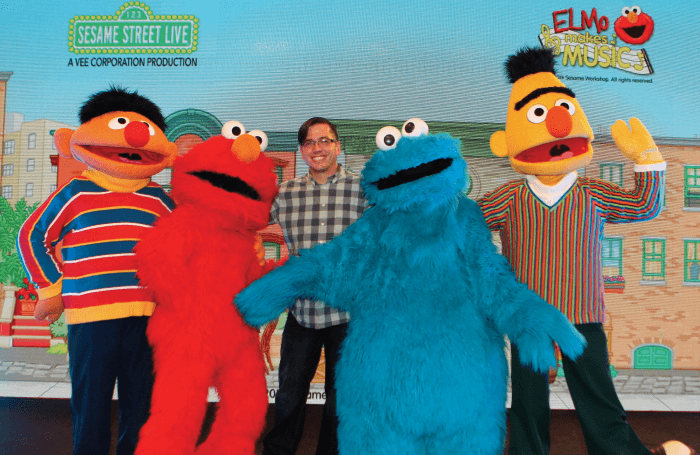 Log on to http://www.rwgenting.com/en/entertainment/2014/sesame_street/index.htm for a preview of the show, showtimes and promotions.